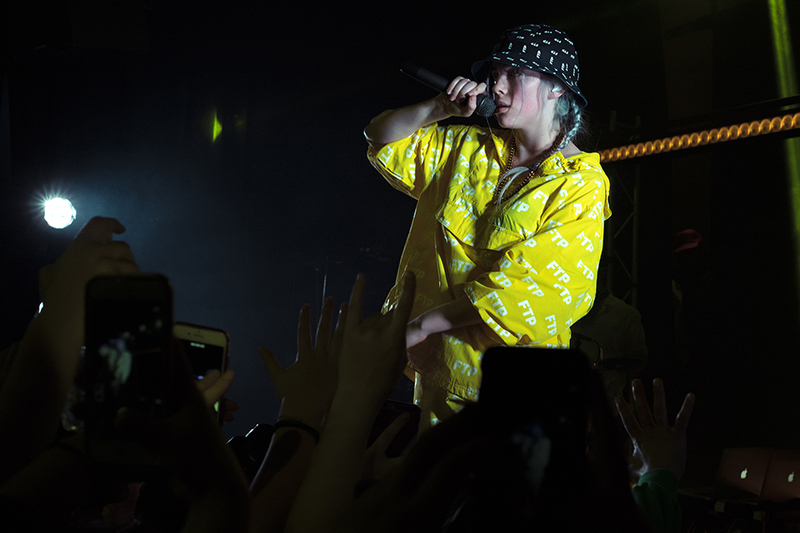 A night on Billie Eilish’s ‘wheres my mind’ headline tour, or how Philadelphia became Billiedelphia for a few hours in March 2018. 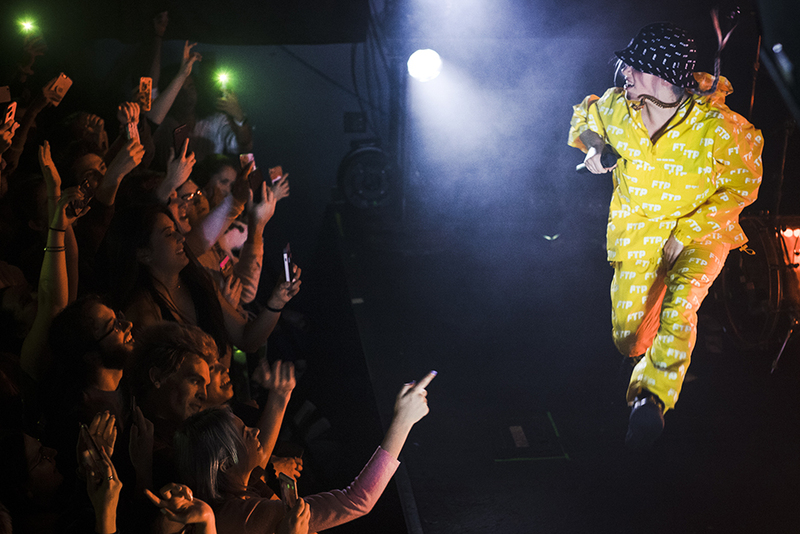 On Billie Eilish’s first North American tour during the fall of last year, she proved that she was worth the hype. 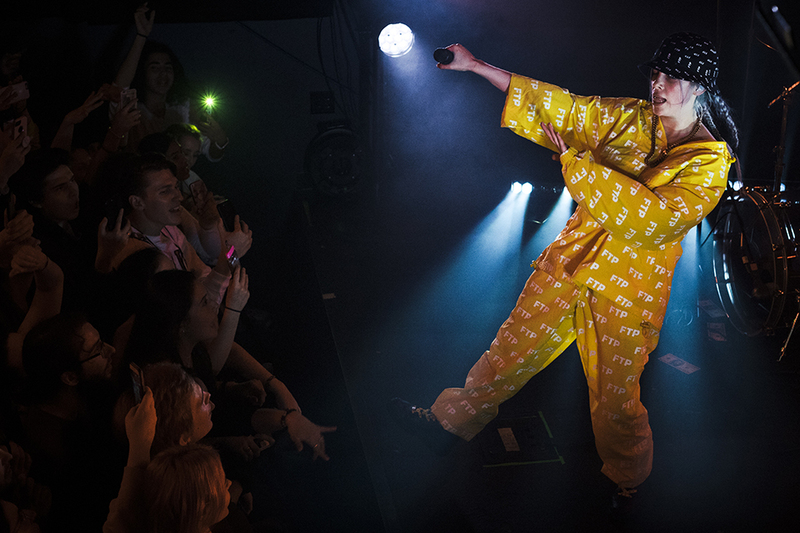 Now, fresh off tours in Australia, New Zealand, and Europe, Eilish is consolidating her name as the star of the future. Unsurprisingly, the wheres my mind tour sold out in a matter of hours, and after leaving her set at Philadelphia’s Coda there’s no denying that sold out tours and overwhelming success is what she has earned and deserves. Opener Reo Cragun graces the audience with a soulful blend of rap, hip hop, and r&b, moving from left to right, jumping up and down, and speaking the appropriate millennial language by declaring “I’m emo.” His interactions with DJ KieroLovesYou are playful and friendly, exchanging banter and thanking parents for working hard and getting everyone where they are. 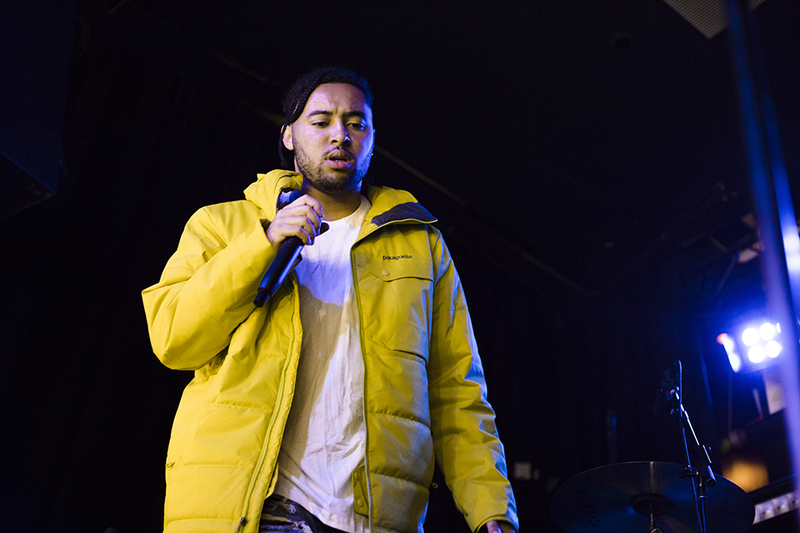 His set is a mixture of his own songs and hits like Drake’s “God’s Plan,” which show him as an artist who values connection with the crowd more than anything else. 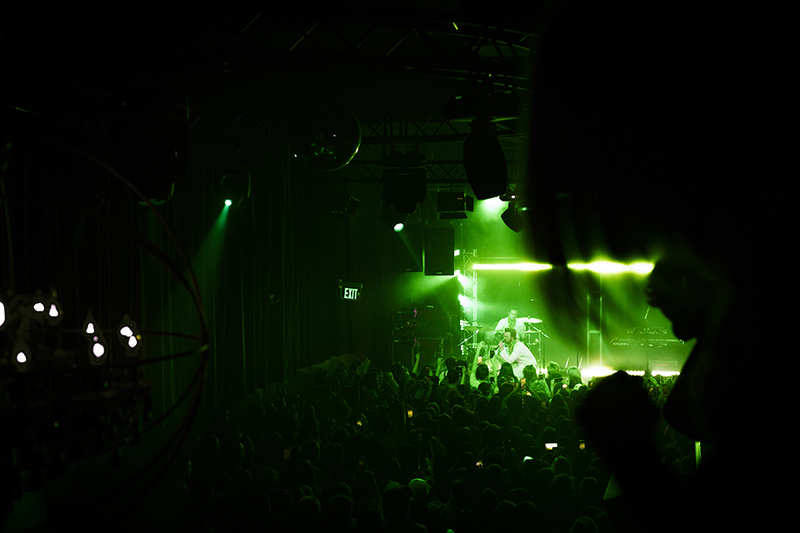 The audience is sold, and the energy is up. The stage is ready for its main act. 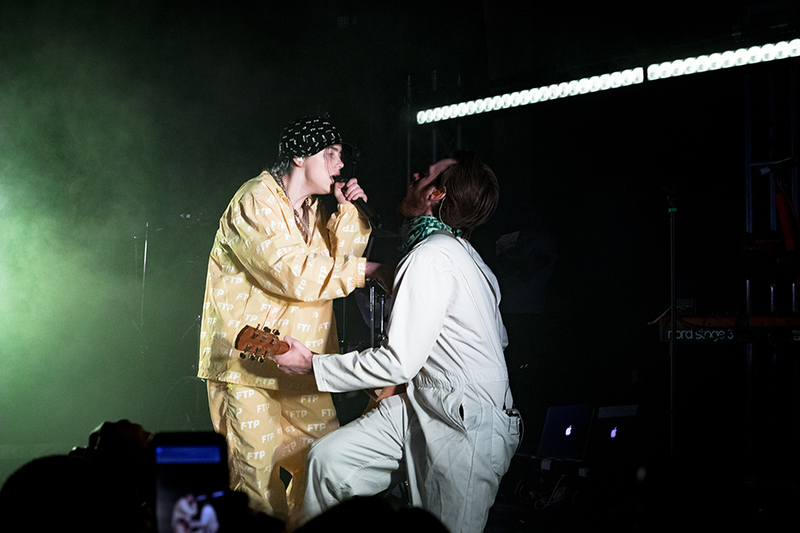 Moments before Eilish takes the stage, brother Finneas O’Connell and drummer Andrew Marshall step on, dressed in white overalls and a wearing green bandanna with “Billie Eilish” written all over it over their noses. 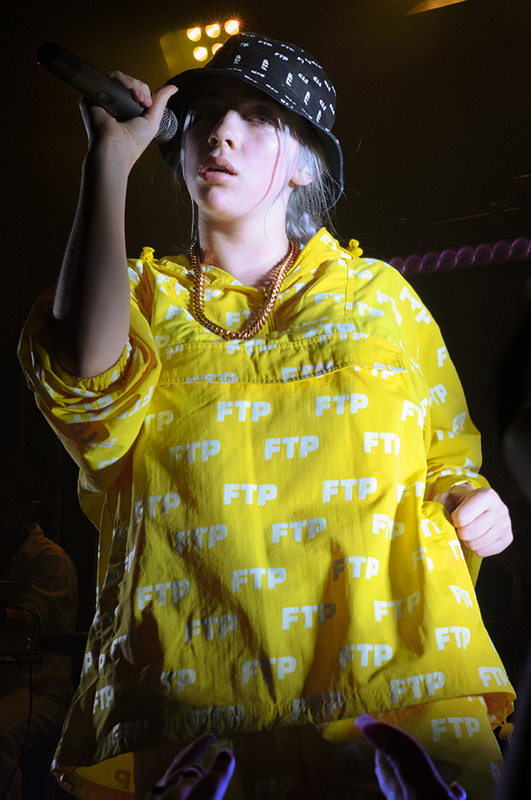 They point toy guns at the audience, and when they pull the trigger, the crowd is showered with fake money with Eilish’s face on it. Then “bellyache” starts, and Eilish appears. She dances and sings along to her bold and daring single, which she’d performed at Jimmy Fallon’s late night show a few nights prior. At the start of the show, she tells the fans she had a bad day but that they were about to make it all alright. It is safe to assume the feeling is mutual. 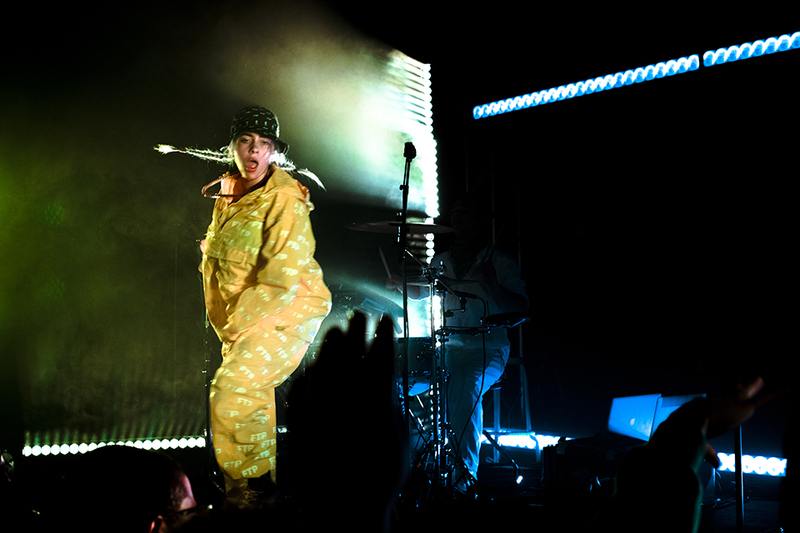 From uptempo “bellyache” to ballad “idontwannabeyouanymore,” Eilish is comfortable and at home whether she’s dancing around the whole stage or singing by a mic stand for a few minutes. Her voice also transitions between different types of music effortlessly. Further proof of that is Eilish’s delivery of “watch” and “&burn,” two strikingly different versions of the same song, the latter featuring Vince Staples, whose rap verse Eilish tackles effortlessly. 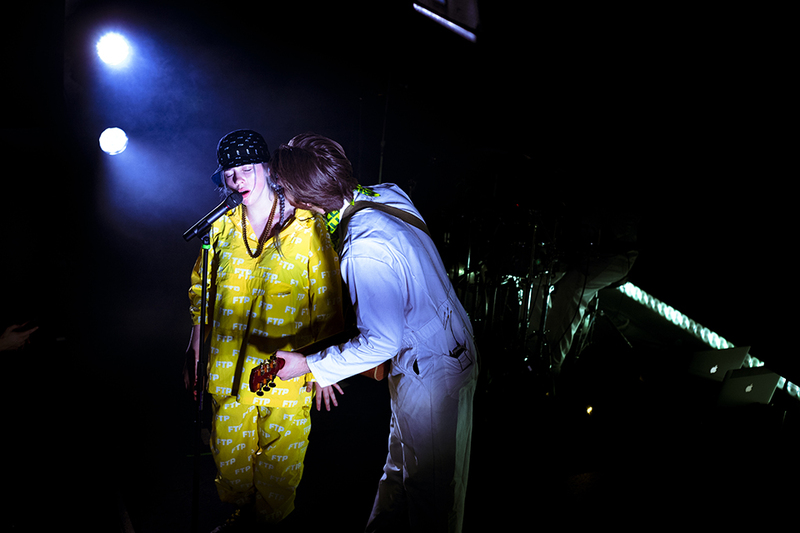 She has never stopped herself from praising her brother, co-songwriter, and producer Finneas O’Connell, and Eilish makes sure he shares the spotlight with her as much as possible, with both of them doing the same dance routine, sharing a microphone during “hostage”, and just showing a beautiful sibling connection. Eilish asks, “Can my brother play a song for you?” and moves to the back while O’Connell sings “NEW GIRL,” a song he released under the moniker FINNEAS. 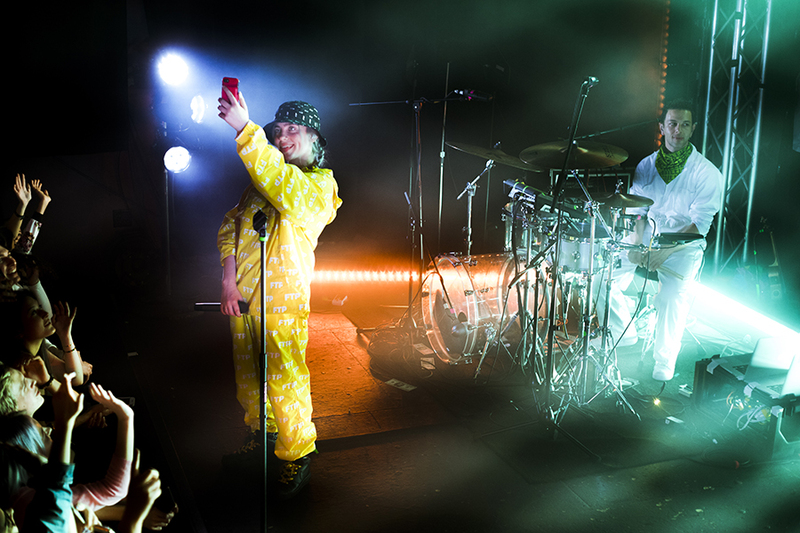 The crowd is just as enthusiastic and receptive to his music as they are to Eilish’s – in fact, in between sets when O’Connell was checking instruments onstage, various “Finneas! 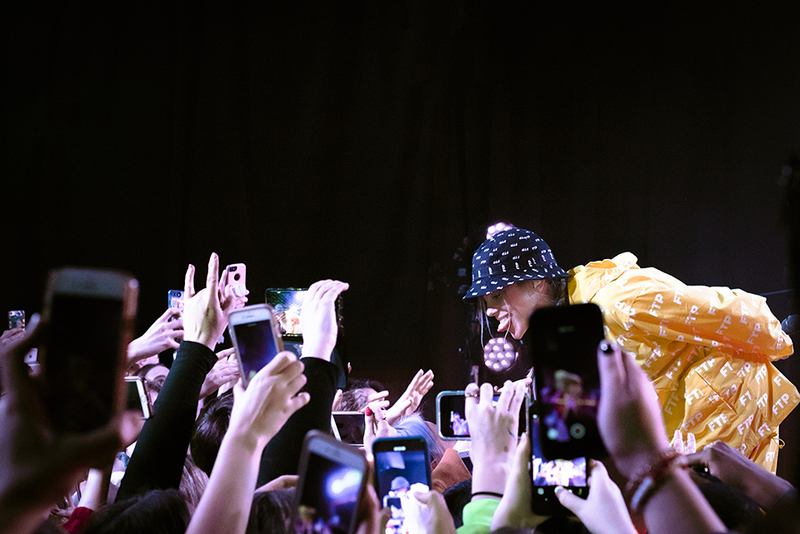 !” screams could be heard from the crowd. 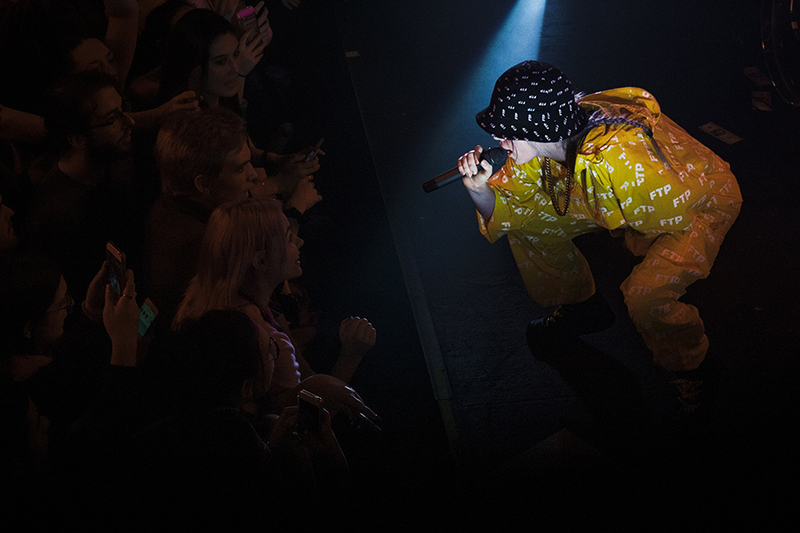 What’s most impressive during the whole set is the passion that is exchanged between artists and fans. “I say this a lot, but I would not be alive without you guys” Eilish says in between songs, sincerely thanking every single one of her fans for their support. 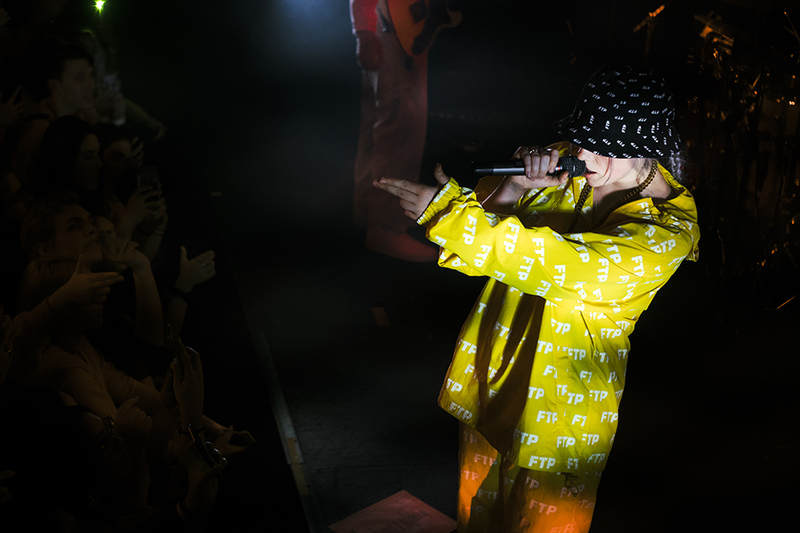 And if anything can represent just how deep this bond is, it was the following moment: walking around onstage before another song, Eilish says that during the pre-show meet and greet earlier she met a fan called Erin, who told her something she wanted Eilish to announce onstage. “She wanted me to tell you that she’s bi” and just like that, a girl’s coming out story was made that much more meaningful and easier because one of her favourite artists supported her through it. 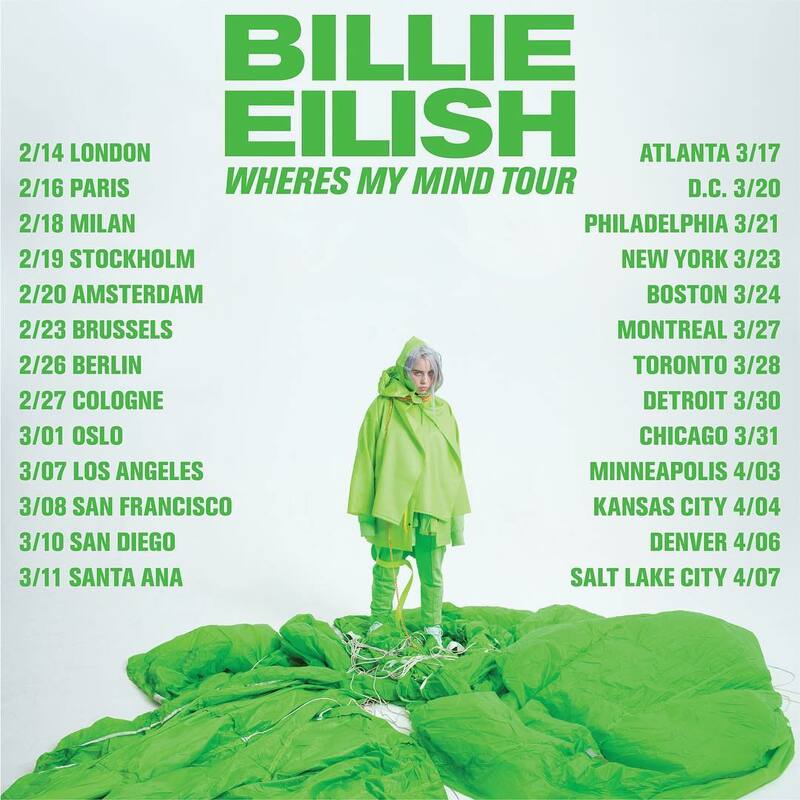 Now with an expanded live band (the drummer who was added to accompany Eilish and her brother, Finneas O’Connell, was not on previous tours) and an impressive light set up, Eilish is fine-tuning her bold artistic vision and converting it into a live show. 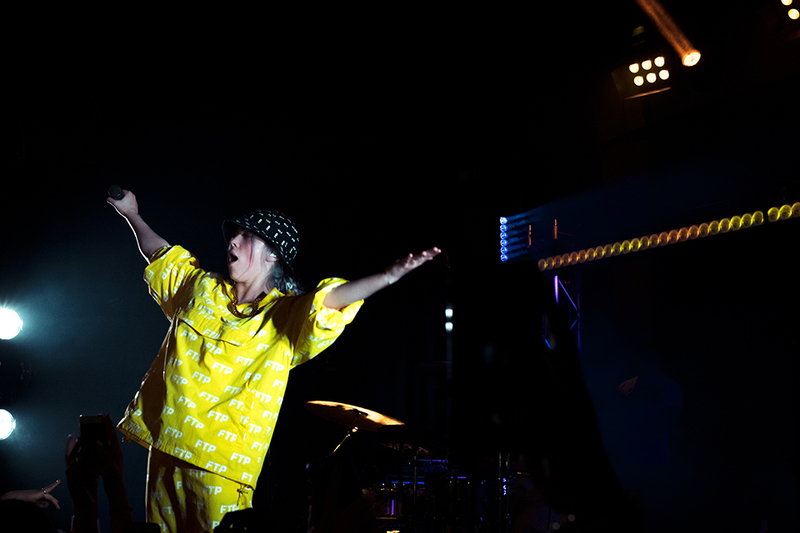 She makes a concert more of an experience, an immersion into her mind, and does not fail to deliver for a single second. Before opener Reo Cragun stepped onstage, DJ KieroLovesYou announced “Tonight, you’re not in Philadelphia, you’re in Billiedelphia” and of course, the crowd went wild. And though odds are he repeats a variation of the same thing every night, his words do come true later on, when Eilish’s presence is so powerful and all-encompassing it takes a second to realise she is still far from being one of the world’s biggest acts – but definitely on the right path to achieve such feat. She leaves her fingerprint wherever she goes, and for a few hours Coda changes from being in Philadelphia to being the home of Billiedelphia. 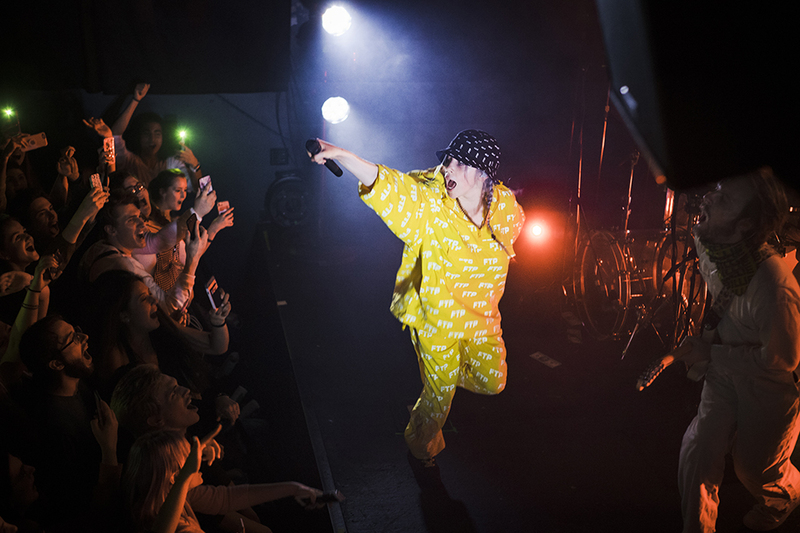 Such power and impact are hard to find, especially when an artist is a few years shy of legally drinking and has not even released a debut album yet, but Billie Eilish is not just anyone. She’s it.